Bar Grating vs. Safety Grating: What’s the Difference? Workplace safety should be every employer’s top priority — but it’s most critical in industrial facilities where the risk of on-the-job injuries is at its peak. To protect workers against the regular hazards of working in the plant, facility managers must implement safety measures to mitigate these risks. Among the most common workplace injuries are slips and falls — responsible for 15% of all accidental workplace deaths. To ensure walkways, service rooms, and other passages are clean, dry, and safe to walk on, a number of walkway grating solutions have emerged over the years. Let’s look at two walkway safety products — bar grating and safety grating — to examine their effectiveness. Commonly used on platforms and catwalks, bar grating features a welded steel composition that provides a strong no-slip surface. It is comprised of wide holes that allow the passage of light through the grating to the floor below. Bar grating is not without its faults, however. The material thickness of steel bar grating can lead to increased weight and manufacturing costs. The holes, though helpful in enhancing visibility, can put workers below the platform at risk of being hit by objects falling through them. The wheels of rolling pallets and carts can get caught in large slots as well, making it difficult to efficiently transport objects from one part of the plant to another. Safety grating is the versatile, lightweight solution for slip resistance on equipment, walkways or manufacturing floors. Metalex’s diamond patterned Deck Span® and round holed Open-Grip® provide 360-degree slip resistance and ensure that light and small debris pass through while preventing the passage of large debris. Our Safety Grating is offered in a broad range of materials and our programmable die technology allows for a customizable design for any application. The manufacturing industry accounts for 16% of fall-related injuries. Don’t let your organization add to the statistic; learn about how to select a safety grating option that works for you. 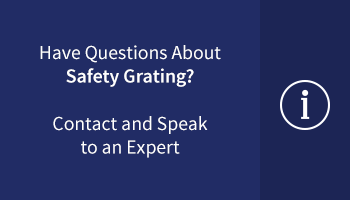 Download our eBook “The Benefits of Safety Grating Over Other Options” for more information. One of the most crucial considerations for a plant or facility is safety. Slips and falls are among the leading causes of workplace accidents. Ladders, scaffoldings, and equipment steps and platforms, especially in wet and slippery environments, can pose significant threats to worker safety. Safety grating is an essential element at any plant or facility. These metal surface coverings provide increased traction when walking on any surface exposed to hazardous conditions, reducing the risk of injury or falls. By installing safety grating in all high-traffic areas, manufacturers and managers can greatly increase safety conditions and lower chances of injuries from falls and slips. Safety grating is available in a number of varieties for almost any situation or environment in order to ensure the safest, accident-free situations across industries. The three most common types of Metalex safety grating are Open-Grip®, Tread-Grip®, and Deck Span®. Deck Span® safety grating is widely used in construction sites, plants, and facilities. It is a one-piece construction that is lightweight, self-framing, and able to withstand heavy loads. It consists of a diamond configuration surface pattern with a relief hole at the point of the diamond, created by cross-hatching reticulated and formed metal struts. This results in a self-cleaning pattern that allows for the passage of light and waste materials. The design of Deck Span® safety grating makes it perfect for environments where maximum grip is needed to ensure safety. This includes features for use inside facilities such as catwalks, open flooring, balconies, stair treads, platforms, and walkways. Deck Span® safety grating is available in a variety of shapes and sizes. Standard channels are featured in sizes ranging from 4-3/4” wide( 2 diamonds )e to 24” wide ( 10 diamond )- and standard lengths are 121-1/2” and 144” long. They are also available in Pre-Galvanized, or Hot Rolled Pickled and Oiled, in 14 or 12 gauge thickness. Other materials include .080” and .100” 5052-H32 aluminum and 16-gauge stainless steel 304-2B.